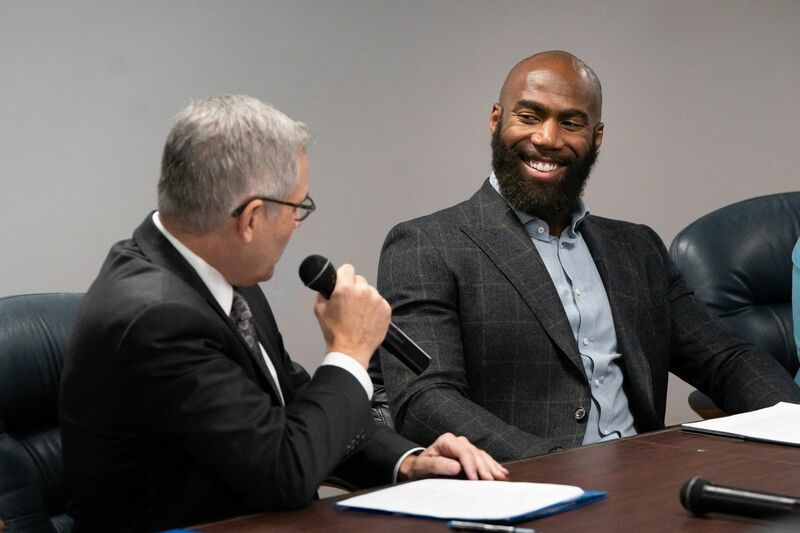 Philadelphia District Attorney Larry Krasner, left, and Players Coalition Co-Founder and Philadelphia Eagles Safety Malcolm Jenkins, right, host a press conference to address the injustices with the money bail system in Philadelphia, November 26, 2018. Our money bail system is a travesty. Every day in Philadelphia, people who are accused but not convicted of a crime are held in jail not because they are guilty, but because they are too poor to purchase their freedom. Judges here routinely put a price on a person's liberty, and it is often one they cannot afford. One in four people is assigned money bail of $50,000 or more. I've witnessed this system firsthand, when my teammates and I watched bail hearings in the basement of the Criminal Justice Center. The stakes at these hearings could not be higher: the chance to fight for your freedom outside a jail or time in a cage; release to a job and family or loss of employment and support. And yet it is a farce to pretend that there is justice in that room. The people charged are not brought into court; they appear via television. More often than not, they cannot hear what is happening — neither the prosecutor arguing for bond nor the magistrate deciding their fate. The magistrate is often not a lawyer, let alone a judge, and has little accountability. >> READ MORE: Why is Malcolm Jenkins bailing out Philly criminal defendants? These hearings lasted two, maybe three minutes, not enough time for a defense lawyer to meaningfully advocate for release. Magistrates do not regularly consider whether someone could pay bail when setting an amount, and many could not. The day we watched, the magistrate set high bail for serious and non-serious cases alike. That system, which punishes poverty, is galling on its face, but all the more so when you consider that almost half of those who are held in jail pending trial are never found guilty. Either their cases are dismissed or withdrawn, or they are found not guilty at trial. But the city gets some flesh: time in jail pre-trial. What I witnessed that day was no aberration. Of people who appear before a magistrate, 42.5 percent receive money bail. Three-quarters are indigent, meaning they don't even have money for a lawyer. And community bail funds, which pool donations to bail people out of jail who cannot afford it, report that bail is regularly set at an unaffordable amount even for minor offenses. Those bail funds therefore find themselves in an endless cycle of bringing one person home as another person lands in a jail unable to pay. This is the dark side of our community. But recently, I saw the brighter side, the fierce power of our city, and its ability to wrap its arms around those who most need support. Just before Thanksgiving, with financial support from the Philadelphia Eagles Social Justice Fund, including personal contributions made by my teammates, the Philadelphia Community Bail Fund bailed out nine individuals. The Philadelphia Defender Association helped identify any needs they might have. Impact Services made sure they had rides home from the jail. The community came together to celebrate their release home to family. And then days later, the Players Coalition organized an event at Impact Services for those individuals and their families. Nonprofit groups stepped up to help in a myriad of ways. Menzfit provided work clothes Frontline Dads mentoring. Our city's participatory defense hubs helped families learn how they could best support their loved ones during the case. Philadelphia Auto & Parole provided transportation. And Ardella's House, Broad Street Ministries, E.M.I.R., Mothers in Charge, the Center for Returning Citizens, and the Philadelphia Opportunities Industrialization Center all provided critical assistance. It was incredible. We have a community that can provide the tools that people need for success. They do so not because it is profitable but because it is right. Our community can help people get to court by providing transport. It can get people ready for jobs, combat addiction, and treat trauma and mental illness. Our community, not jail, provides the resources that keep people on the path to success. Our community makes us safe and better. Jail doesn't. And neither does the money bail system. We must start investing in people, not in jails. Ending the cash bail system, and bringing people back so that the community can hold them, is a good place to start. Malcolm Jenkins plays for the Eagles and is an advocate for criminal justice reform.